Interestingly, this little, sporty-looking vintage machine was not designed as a small-displacement track-terror endurance racer. It was intended to be simple, durable transportation for the masses: a painless to buy, easy to maintain everymachine. That being said: Italians seem to be largely unable to keep from infusing even their most pedestrian models with passion and sporting feel, and this is no exception. 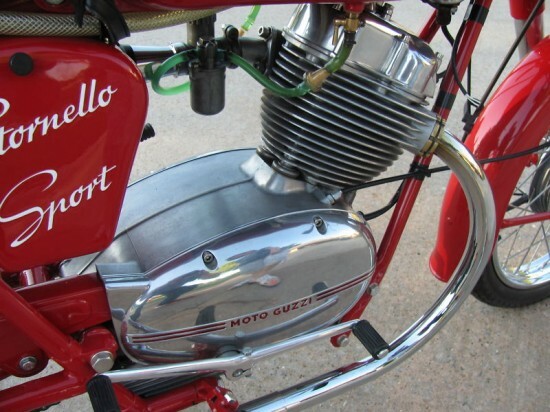 The Stornello Sport’s 123.175cc motor put 8.5hp wide spread of usable power through a four-speed gearbox. 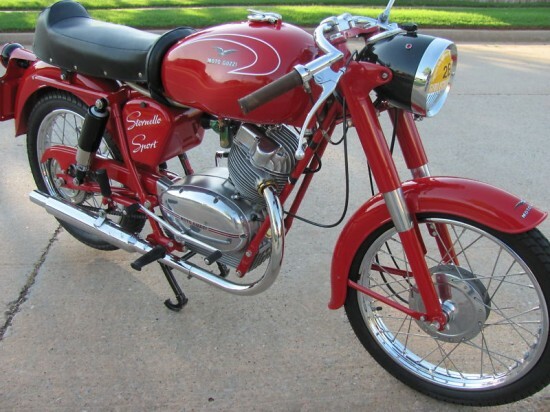 In addition to a 20% increase in power, the Sport model also featured a racing seat, low bars, cut-down fenders, lightweight wheels, and slightly increased fuel capacity. 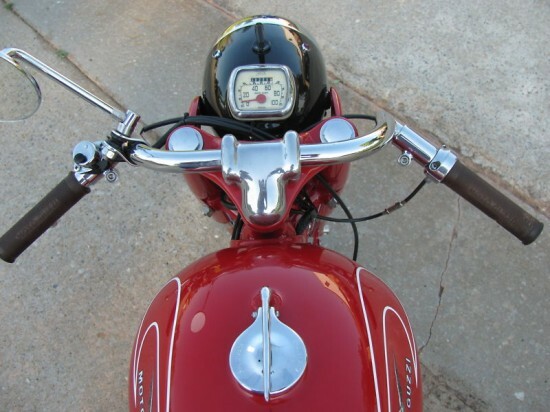 Take a look here for the original eBay listing: 1960 Moto Guzzi Stornello Sport for Sale. “This bike is immaculate! Never down, no tip overs . . . No stories! It is in perfect running condition. It needs nothing. You will not be disappointed. It is also Moto Giro eligible and still has the last Giro sticker on headlight lens. As a testament to its mechanical condition, this Sport finished 1st in it’s class in the Arizona Moto Giro 2011, and 3rd in it’s class in the California Moto Giro 2011. It also won 2nd place in the Concurs d’Elegance in Huntington Beach California 2011 before being retired to a leisurely life tooling around my neighborhood. Always stored inside. 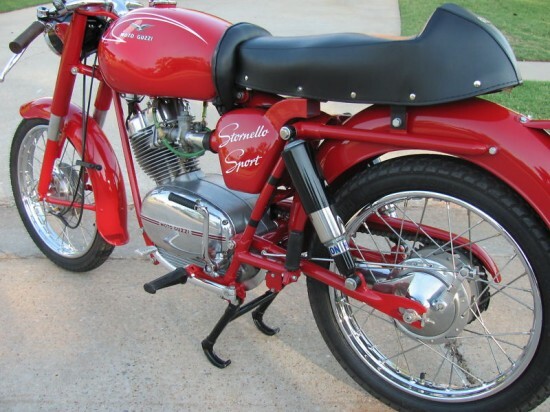 This is probably the cleanest and nicest Stornello Sport in the United States. It could be put in a museum as it sits. You will have a smile from ear to ear, and people will gather around to ogle this beauty where ever you park on your pub runs. This is a rare opportunity to own a vintage piece of Italian heritage. 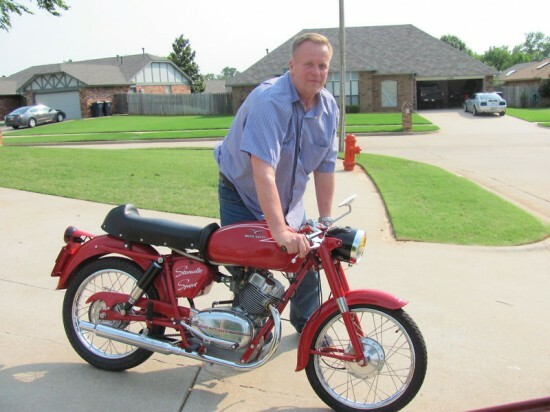 I have priced this motorcycle to sell quickly to the discriminating buyer who wants only the best. Clear title in hand and registered in Oklahoma in my name. I’ve no idea what the real value of this bike is: they’re not rare at all in Europe, but are pretty uncommon here in the states, especially in this condition. And its age and displacement make it eligible for MotoGiro events, so this might be a classy way to get into the vintage bike community!